Let me begin with two language points. First, I don’t think “frozen conflicts” is a very good term for secessionist conflicts in post-Soviet space, or indeed elsewhere, although I admit to using it sometimes. The problem is that it implies a static quality to the conflicts that is not necessarily there – the “frozen conflicts” have not always been frozen. Chechnya unfroze dramatically in 1999, and there have been violent flare-ups in all other cases, except perhaps Transnistria, most notably in Abkhazia and South Ossetia in 2008. That is true with secessionist conflicts elsewhere as well – Kosovo was never really “frozen,” and Krajina became “unfrozen” in 1995 when the Croatian government retook it by force. However, even this category of “unrecognized state” is also a little misleading, because “international recognition” is not an either-or property (although full UN membership is). Russia and a few other states have recognized Abkhazia and South Ossetia, while the United States and many other states (108 out of a total of the 193 states with seats in the UNGA) have recognized Kosovo. At any rate, I generally use alternative terms such as “breakaway region” or “unrecognized state,” which at least don’t imply that the conflicts are forever frozen. Second, there is the question of what to call the breakaway region in the Donbas. For obvious reasons, many Ukrainians do not like the term “Novorossiya,” which they feel affords the separatists a legitimacy, and a right to naming, they don’t deserve. Even less do they want to suggest that the area currently controlled by the separatists should extend to all of historical “Novorossiya” – that is, all of what was the guberniia of Novorossiya in tsarist times, from Russia along the Sea of Azov all the way to Transnistria. That, many Ukrainians understandably believe, is the preferred outcome not only for many of the separatists but for the Kremlin as well, and they note that it is Putin’s term of choice. And historians also object that historical Novorossiya overlapped very little with the Donbas breakaway region. The problem, however, is that all of the unrecognized states that I am aware of have had proper names attached to them – Chechnya, Transnistria, Taiwan, Cyprus, and so on. Perhaps in official usage the region may be referred to the way that Kyiv, as sovereign in the territory under international law, prefers, but in colloquial usage I suspect the breakaway state will be called by a proper name, especially if, as seems very likely, the conflict lasts. There is, however, no proper name for the region, at least none that I can think of, that works well. As of now, the Donbas enclave is less than the entirety of the Donbas, less than the entirety of Donetsk and Luhansk oblasts, and of course more than the cities of Donetsk and Luhansk (and the Donetsk/Luhansk oblast vs. city difference is in any case confusing for outsiders). Nor is the media going to want to call it “the DNR/LNR,” which is cumbersome, or “the self-declared Donetsk and Luhansk People’s Republics,” which is even more cumbersome. So my guess is that, if the conflict lasts, and if Donetsk and Luhansk manage to unite (which is no sure thing) and begin referring to their union state as “Novorossiya,” then that is what the outside world will eventually call it, without the quotes, even if Ukrainians object. So let me turn to some generalizations about other breakaway states. I focus for the most part on the unrecognized states in post-Soviet space – Abkhazia, Chechnya (1996-1999), Nagorno-Karabakh, South Ossetia, and Transnistria. That, I should add, is true of other breakaway states as well, with the possible exception of Eritrea, although it is important to remember that Eritrean independence was a product of the successful effort by the Eritrean separatists, in collaboration with other armed movements, to overthrow the Mengistu regime. Eritrean independence was thus “peaceful” only in the sense that the new regime in Addis Ababa agreed to it in 1993. Even in the “soft case” of Transnistria (which I will discuss more in a moment), Chisinau has no legal writ, pays no pensions, collects no taxes, and so on. That is equally true in Abkhazia, South Ossetia, and Nagorno-Karabakh. Nor have any of the breakaway regions agreed to cede control of their borders to some other entity. This is true both of the border with the parent state as well as external borders, and in particular with the region’s patron state – Nagorno-Karabakh with Armenia, and South Ossetia and Abkhazia with Russia. Some have agreed to a peacekeeping force and/or a monitoring mission along the ceasefire line (usually referred to as “the line of contact”). But in every case the separatists exercise control of their side of the line. The implication, I should note, is that it is very unlikely that the Donbas separatists, and Russia, will cede any meaningful control of the Donbas enclave’s borders to Kyiv. Notably, the international community has not convinced any breakaway state to cede any territory since ceasefires came into force. It has not managed even to convince Nagorno-Karabakh to cede any of the territory they control in the five districts of Azerbaijan proper that are not part of Nagorno-Karabakh. In at least one instance – South Ossetia – Tbilisi actually lost control of some territory after 2008. To my knowledge, the only partial exception is the repatriation of Georgians who have returned, in part, to the southern Gali district of Abkhazia. Of course, the fact that ethnic divisions between the residents of the Donbas are not as acute as elsewhere may make it easier for IDPs to return to the Donbas if and when the fighting ends, but I doubt many will, and I suspect very few will who clearly sided with Kyiv. 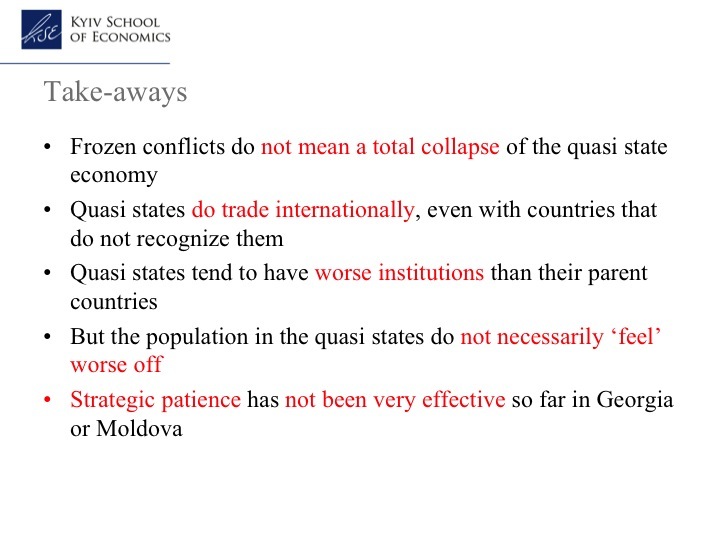 As Tom Coupé (Associate Professor, Senior Economist at Kyiv School of Economics) argues in his presentation today, the breakaway states may not be doing better economically than their parent state, but it is not clear that they are doing worse (see his slide below, which I am including in this post with his permission). It is important to appreciate, however, that this is quite a low bar – Armenia, Georgia, and Moldova are all regional outliers as economic underperformers. So in part the finding may tell us more about economic costs for all parties – the national states as well as the breakaway states – and less about significant economic improvement in the breakaway regions. At any rate, my impression is that living standards in the breakaway regions vary. They are not that bad in Transnistria (where there is still some industry and comparatively open borders) and Abkhazia (agriculture, some Russian investment, some Russian tourism), but they are quite bad in Nagorno-Karabakh and especially in North Ossetia. 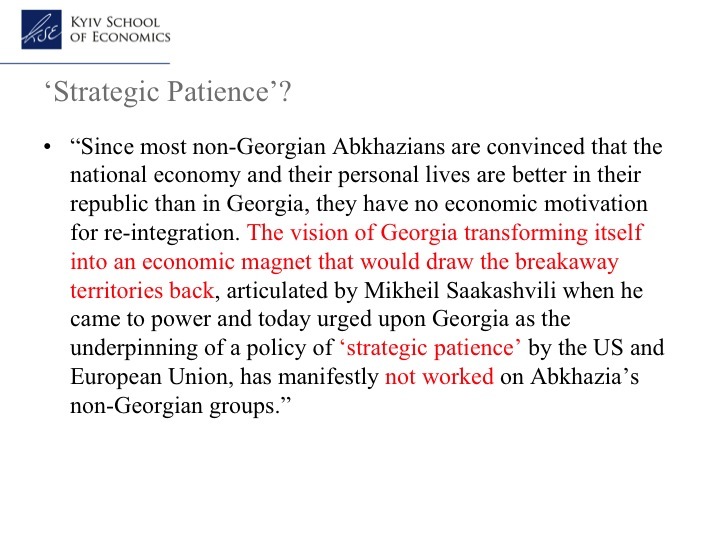 Also, while I quite agree with Tom that the evidence does not suggest that “strategic patience” works very well – that is, the hope in the national capitals that economic growth will eventually lead economically isolated and depressed breakaway regions to seek eventual reunification (see the slide below, also posted with Tom’s permission) – that does not mean that “strategic impatience” will work either. All the breakaway regions, with the notable exception of Chechnya (which I will discuss in a moment), are dependent on an external patron state or states. Abkhazia, South Ossetia, and Transnistria are dependent on Russia, while Nagorno-Karabakh is dependent on Armenia and (less directly) on Russia. However, my impression is that the degree of external dependence varies. Transnistria, no doubt thanks in part to the fact that it does not share a border with Russia, is relatively independent of Russia except militarily. I also think that Abkhazia and Nagorno-Karabakh are politically more independent than many often assume, but they are both economically and especially militarily dependent on their patrons. South Ossetia, on the other hand, is entirely dependent on Russia – it is more-or-less administered and funded directly from Moscow. In each case, the breakaway regions have large criminalized sectors and informal economies, as well as significant problems with corruption and elite dissensus (as manifested most recently in Abkhazia). Again, however, my impression is that the extent of these problems varies considerably, albeit in a complicated way. Nagorno-Karabakh, for example, strikes me as having relatively less problems with organized crime and elite dissensus than elsewhere, perhaps because its location makes smuggling operations much less profitable. Chechnya is the only post-Soviet secessionist conflict that has been “resolved,” at least in the limited sense that Moscow’s position is that it has restored its sovereignty over the region and that the Kadyrov regime is in compliance with the Russian constitution. De facto, however, the extent of Moscow’s sovereignty in Chechnya is not entirely clear – were Moscow to try to remove Kadyrov, or force him to take measures he resisted, Moscow might not prevail without provoking another war. At any rate, the Chechen case is an exception, probably for a variety of reason, including: (1) Russia proper is much larger than Chechnya and had a huge preponderance of force vis-à-vis the Chechen separatists; and (2) Chechnya had no external patron state. The separatists did receive some support from the international jihadist movement, but not from states, and the support from jihadists was limited by the difficulty of accessing Chechnya from abroad. I should note that Krajina also was “resolved” by force. An obvious point here is that its external patron, Serbia, was militarily weaker than the key patron state in the post-Soviet space, Russia. Obviously this is not an easy thing to quantify, but culturally Russians and Chechens are distant by most any measure, as are Armenians and Azeris. Abkhazians and Ossetians are perhaps a little less distant from Georgians. And Moldovans and Transnistrians (who are what I would call “ethnically” Soviet) are less distant yet. In contrast, Ukrainians and Russians (and Russian-speakers) are culturally very close, and they have no real history of interethnic bloodletting (although the way the history of World War II is interpreted in eastern versus western Ukraine has certainly been divisive). 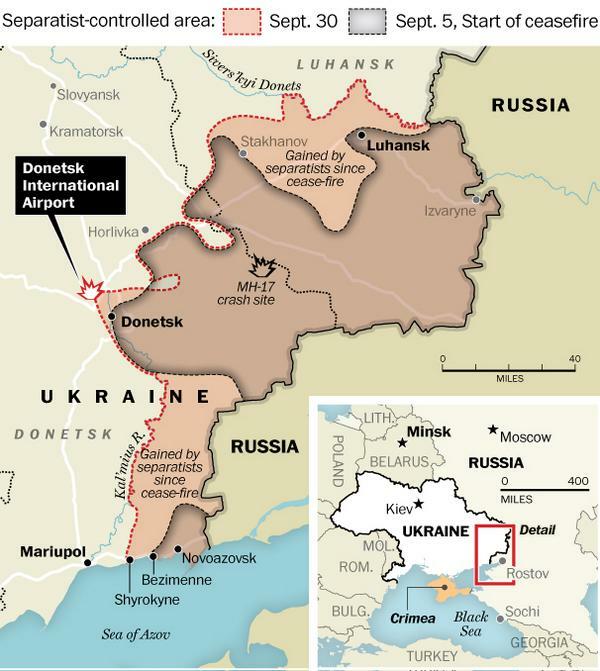 Which makes the Donbas enclave closer to Transnistria that to the other cases. My impression is that Azerbaijanis almost universally want Nagorno-Karabakh back, and that Georgians want Abkhazia back and are especially convinced that the loss of South Ossetia is unacceptable. Moldovans, however, appear to be ambivalent about reunification with Transnistria. There are many factors that might explain this if my impression is correct. Moldovan ethno-nationalism is particularly contested and complicated by the Romanian factor; there is not a clear “ethnic” dimension to Transnistrian identity; and the emotional attachment of Moldovans to the territory itself is less than in the other cases. But I suspect that the most important factor is that many Moldovans worry about the political, economic, and social consequences of trying to reintegrate Transnistria back into Moldova – in the sense, Moldovans are ambivalent the way South Koreans are ambivalent about reunification with North Korea. Again, the outlier here is the relationship between Moldova and Transnistria. In the other cases, relations between the parent government and breakaway government are minimal and very tense. That is less the case between Chisinau and Tiraspol. In addition to the tacit cooperation with Tiraspol on collecting duties on Transnistrian trade with Ukraine, Chisinau has entered into formal agreements that allow goods to be shipped, and duties collected, on goods from Transnistria that cross Moldova proper and are exported on to the European Union and elsewhere. This, then, is the “soft case” – or least an example of “soft borders.” Unlike elsewhere, Chisinau has not attempted to isolate Transnistria entirely or do everything in its power to hurt it economically. In considering the lessons from all this for Ukraine, an initial point is that the Donbas enclave is different from the other post-Soviet cases in ways that will make military stabilization of the conflict more difficult. The population is much larger (some 3.3 million) than Transnistria (around 500,000), Abkhazia (less than 250,000), Nagorno-Karabakh (less than 150,000), and South Ossetia (around 50,000). Territorially it is also much larger, and the line of contact (if and when one is established) will be very long, with no natural geographic features to help stabilize it and facilitate international monitoring (unlike, for example, the Dniester River in Transnistria, the Inguri River in southern Abkhazia, or the mountains of Nagorno-Karabakh). Moreover, the separatists are considerably more divided internally than was the case elsewhere, where elites came from existing Soviet administrative structures and elites and society are relatively united. That is clearly not the case in the Donbas enclave today, where we have two self-declared “people’s republics” and multiple militant groups vying for control and in varying degrees of opposition to each other. That said, in my view the closest parallel to the Donbas enclave is Transnistria. The “ethnic” element is relatively muted, the breakaway region is culturally Soviet, with what might be called a blue collar culture. This suggests that Kyiv is going to face some difficult choices if we get a stabilization of the line of control and a genuine ceasefire in eastern Ukraine, including the following: (1) whether to accept a demilitarized zone (as in Transnistria) that is monitored, for example, by the OSCE, one that perhaps includes Russian monitors; (2) whether to accept some kind of international peacekeeping force, and again one that might include Russian soldiers; (3) whether to take a hard or soft approach to trade with the separatist enclave, including the question of whether to deliver natural gas to the region during the coming winter. There is also a choice as to whether Kyiv continues to pay pensions and provide other social benefits to civilians in the breakaway region. There is, of course, one major difference between Transnistria and the Donbas enclave, which is the geopolitical dimension of the conflicts. Not only does the Donbas enclave border on Russia, but Moscow feels, for obvious reasons, that Ukraine is much more important to it than Transnistria or any of the other breakaway states.